#FollowTheStar is the Church of England's 2018 Christmas campaign. 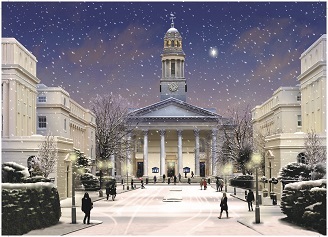 Thousands of Christmas services and events will be taking place in parish churhces all over the Diocese of London in the run up to Christmas - as well as here at St Marylebone Parish Church. "For many of us, Christmas brings up so many emotions, memories and expectations. We have one nativity story, but it can seem like we all have very different Christmases. For you it might be a time of joy and togetherness. Or perhaps it’s all about planning and to-do lists. Many others can find it a sad and lonely time - nagged by the feeling that your Christmas is not like those ‘perfect’ ones we see in the media. But just like the unexpected assortment of people who were invited to meet the baby Jesus, #FollowTheStar doesn’t ask you to be perfect. It says: come just as you are to take the life-changing Christmas journey." Many of the services listed here are free, but some are ticketed and it is always best to check details with the sponsoring organisation first to avoid disappointment. Click here for the complete list.